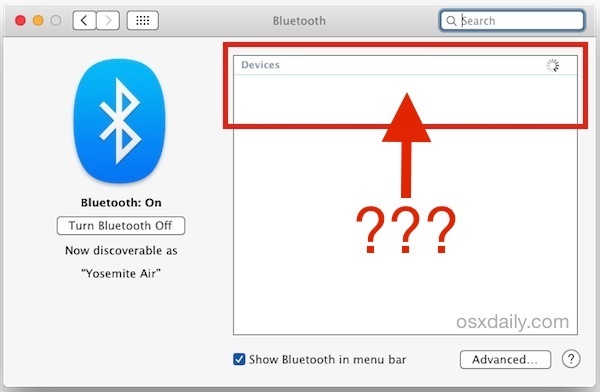 Some Mac users running OS X Yosemite have discovered Bluetooth to become unreliable, either dropping device connections constantly or even simply not discovering a working Bluetooth device. For example, some users who are trying to use a PS3 controller with the Mac in OS X Yosemite may find that the Mac is unable to locate the Bluetooth controller at all, despite being right next to the computer and properly following the configuration instructions. I know those troubleshooting directions sound a little bizarre, but those are actually Apple recommendations for fixing the Bluetooth discovery problem with OS X Yosemite, and it almost always works! If you’re still running into Bluetooth problems after trying the weird USB disconnection two minute protocol, resetting the Mac SMC may help as well as simply turning Bluetooth OFF and back ON again through the OS X preference panel. Presumably the Yosemite and Bluetooth problem will be resolved in an upcoming OS X 10.10 system update, so be sure to update OS X when new versions become available. Thanks but how about bonjour discovery problems in Yosemite?? AirPlay devices pop in and out of the network like crazy now and airport utility is basically useless now. So far I’ve not had any joy from apple support … Some of whom seem to have little understanding that bonjour even exists!! Seems I’ll be sticking with Mavericks for a while longer. Or until the next operating system at this rate. I wouldn’t get your hopes up. Fixing bugs seems to be a low priority at Apple – but hope springs eternal. I have 10.10.3, and it does not seem that the issue was solved. Moreover, the issue appeared with 10.10.3. Bluetooth on 10.10.2 worked very stable. To follow Apple recommendation to reset RPAM or SMC every couple day is nonsense. Thank you! I have been having issues with bluetooth since yosemite and restarting the computer and resetting the PRAM has been annoying to say the least. With my latest connection issue, I turned off the wireless and the bluetooth reconnected quickly. Then I was able to turn the wireless back on and everything is working great. I can’t believe that after all of my searching I didn’t find this solution earlier! Wow, exactly my problems as well! This will help me not having to reboot my machine each time! Thank you for this tip! It worked for me as well. Was about to start the yelling at the computer portion of this experience when I tried this. worked like a charm. Thank God for the comments section!!!!! If you previously updated your BlueTooth preferences to alter the minimum bit rate, that could be the cause. I had previously changed the minimum to fix cracking noises with a Jambox. In Yosemite, with the minimum value not at it’s default, new BlueTooth devices couldn’t be discovered. Hmmmmm…… Could it be Yosemite is not ready for prime time? Even after 10.10.1 and 8.1.2 on the 6P? I have an I Mac 27 inch. I have been offered Os x Yosemite for free. I have read up on all the reviews, most of which are complaints about Os x Yosemite. Why would a large company like Apple offer a program with so many problems. I think I will wait until all the problems are fixed before I install the program. Been having problems with my magic mouse dropping connection after upgrading to yosemite, glad to know i’m not the only one facing bluetooth problems and that a fix could possibly be in the works over at Cupertino. So, we’re going to spend a year getting this thing to work, just in time for the next operating system to come out and make this obsolete? Brilliant. I’ve had Macs since 1987. This is the first time I have opted not to upgrade to the newest operating system. At the very least, I consider it hideous to look at. I know some people like it, but it lacks elegance; and the Mac OS always had something about it that made it more elegant than others. Yosemite looks more like something a 5-year-old would draw. 4) Formatted hard drive and installed fresh copy of Yosemite. Nothing has changed the outcome of the bluetooth not seeing any devices… about to go back to Mavericks. I had the same problem, tried the same solutions and my issues remain. I am trying a USB Bluetooth adapter which isn’t turning out to be a simple fix… oh well. Tried it, this failed. Do you have a fix since your last tip ? This process worked perfectly for me. Running OSX Yosemite 10.10.2 on Macbook Pro. Bluetooth keyboard and mouse had been connecting fine even with this version of OSX, and suddenly today I couldn’t see either as shown above. I do have a USB 3.0 drive plugged in, so I followed the steps above and sure enough, both became visible again after a few seconds of searching. I left my computer off for about 4 minutes just to be sure. So what does it mean when my PS3 controller doesn’t appear in the Bluetooth prefs, but it DOES appear in the Bluetooth menu? I’d also love to know why this happens. I see it listed as “connected” in the system menu drop down, but it doesn’t show up in the preferences menu at all. It seems that this was a deliberate choice on the part of Apple. I actually thought a device was defective because of this and considered returning it. It seems that for Bluetooth 4.0 LE devices, Apple does not show them in the Bluetooth menu on either OS X or iOS – it will only display them in apps that support communicating with that device. So once it’s connected, it will appear in your bluetooth menu, but it will never show in the system preferences pane. Shutdown worked for me, but restart didn’t. Your device will then (hopefully) reconnect as normal. This works every time for me. I can’t recall where I found this to give credit where it is due but I hope it helps. This works perfectly!, Thank you for posting this! Worked perfectly on El Capitan (10.11.3). Sounds weird. But worked for me as well. Thank you! My touchpad was showing in the devices menu but would not ever connect, and shutting down and immediately powering up was not fixing it, tried twice, tried removing and re-pairing many more times than that. Following the unplug usb, shutdown wait 2 minutes, power back on fixed it. Definitely appreciate this post. This solved my issue – disconnect USB. Power down for several minutes. Upon power up, my Magic Mouse could connect. Strange behavior, Apple. I’m using the M557 logitech and I had to just shut off wifi and it was able to pair. Hope this helps! I had just updated my 2013 iMac to Yosemite 10.10.4 and lost all connections to everything Bluetooth. It was even gone from the system preferences window. I tried as suggested on another trouble-shooting forum by resetting the PRAM and that worked like a charm. Everything is back to normal. Updated to Yosemite. Bluetooth connects happily to the trackpad. But my cell/mobile phone remains invisible. Connected readily to ML and Mavericks. What if you can’t access the computer because the keyboard blue tooth is not working? I can’t get to preferences or anything else because I can’t enter my password to get into the computer. 2.- Find bluetooth device (yeah!, you can see it). Try to use ethernet instead of Wifi. Worked for me too! Great, thanks! I will never NOT read comments again. This worked like magic!! My bluetooth speakers were not being discovered in El Capitan. I resolved the issue by choosing “Browse Files on Device…” in the bluetooth menu just to see what would happen. This pulled up the “Select Bluetooth Device” window, the speakers were discovered, I was able to pair them with the computer, and the speakers showed up in the Sound preference pane. They are now working by means of a counterintuitive process. Clearly the Bluetooth menu and the Select Bluetooth Device use different discovery methods. This is the type of thing that made older versions of windows so unfriendly to the user and that seems to represent of a trend toward sloppy design at Apple. I’ve tried all of the fixes I’ve found, including all of the above. My Bluetooth icon has a — strikethrough, but my keyboard and mouse are connected. When I try to pair my iPhone, it says the iMac is not connected to the bluetooth network. But then the keyboard and mouse ARE connected. Very perplexing. Running 10.10.5. Hey David, I’m in the same boat. Tried every single fix. Software is up-to-date, too. No luck. Back to a Dell scrolling mouse. Wow! All that worked! Thank you! Still an issue, and I’m running 10.5.5. Will not find the PS3 controller at all, and have tried all the above. Still an issue in 10.11.5 with my macbook. 2 year old bug now. I’ll go get my phone and play music over my bluetooth speakers, but jeez… you don’t think it should be fixed by now, Apple? 2016 etc. Ok, so this is what worked for me. I had already reset the PRAM and SMC without any luck and I’m using the most current release of OS/X available. Pretty frustrating, but thanks to the article I posted above, I reset the bluetooth module, but that was still not enough. I decided to remove all devices and try again (acting like a Windows user here, shutting down and restarting after every change). The device appeared but wouldn’t pair. Turned it off and on (also did this plenty), turned bluetooth off and on, turned off the wireless, and then tried the bluetooth off and on and device off and on again. It appeared again. And it paired. I think this is just insane, but I am happy that I got it working. I’ve given up many times before. Still don’t know how I feel about this. It’s pretty frustrating that my $3800 machine can’t talk to a $100 boombox when my phone can. 4. BINGO – I can see my device to pair !! !